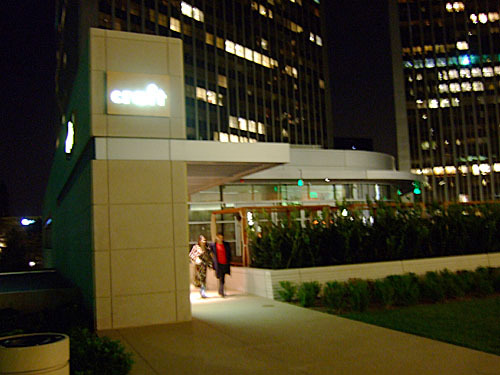 Craft Los Angeles opened last year as the newest entrant into Tom Colicchio's growing restaurant empire. Colicchio, of course, is best known as the founder of the much-lauded New York eatery Gramercy Tavern; he was also a judge on TV's Top Chef. 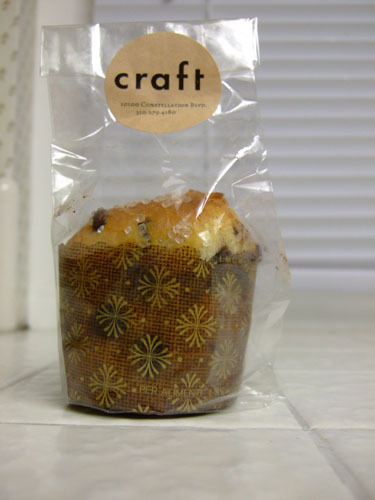 Craft is located in Century City, sandwiched between the Century Plaza Towers (the two triangular buildings that form one of the most recognizable landmarks of the neighborhood) and the newly constructed CAA building (a landmark in the making). 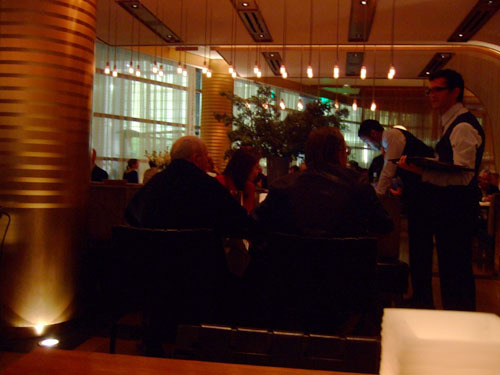 As such, the restaurant sees its share of bankers and agents, especially during lunch service. One enters the restaurant near the bar/lounge area before moving on to the main dining room (pictured). Anchored on one side by a private dining room and wine cellar, the room consists of a mix of booths, tables, and benches, and holds over 100 diners. 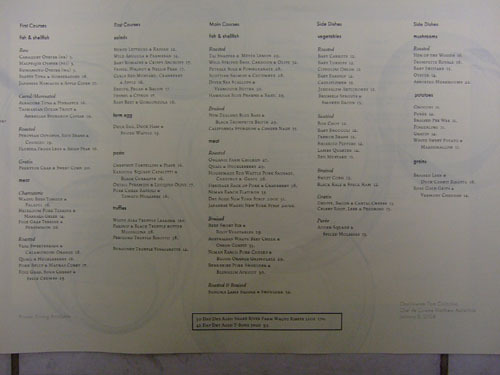 Craft's menu is diverse and should have something for everybody. 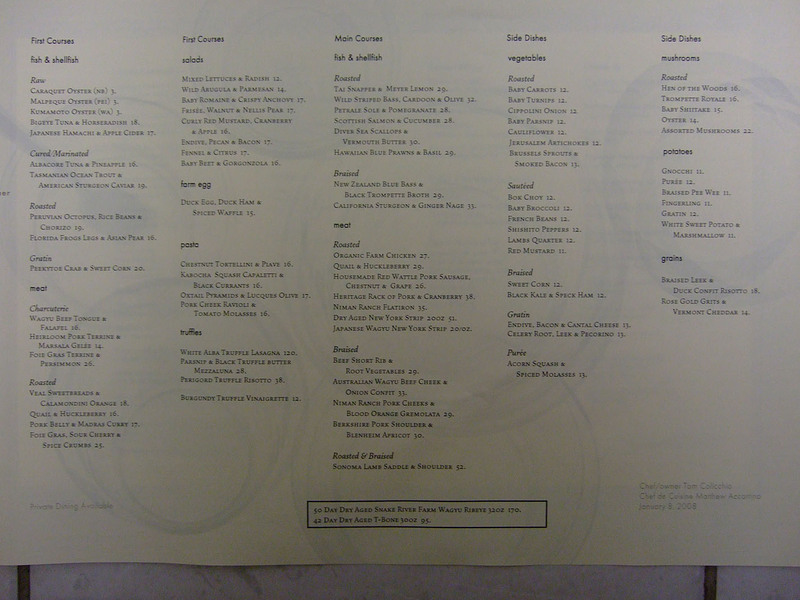 Although it changes regularly, the menu maintains a core set of items; thus diners should expect a consistent gastronomic theme, while still being provided with a wealth of new items to try on each visit. 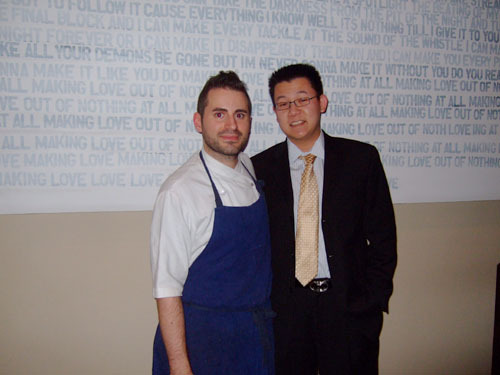 The Chef de Cuisine is Matthew Accarrino, while Catherine Schimenti takes the role of Pastry Chef. Click for larger versions. 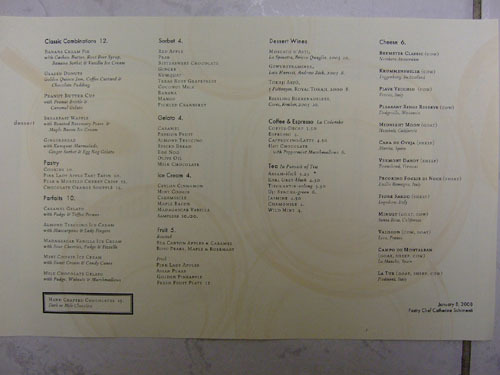 Of course, for me, ordering à la carte is virtually verboten. But Craft doesn't offer a tasting menu, or does it? 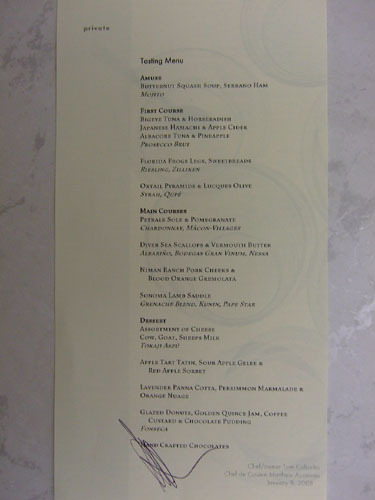 I was told by the hostess that guests wanting such a menu usually call and arrange in advance. However, I asked nicely and the kitchen was kind enough to grant me my wish. 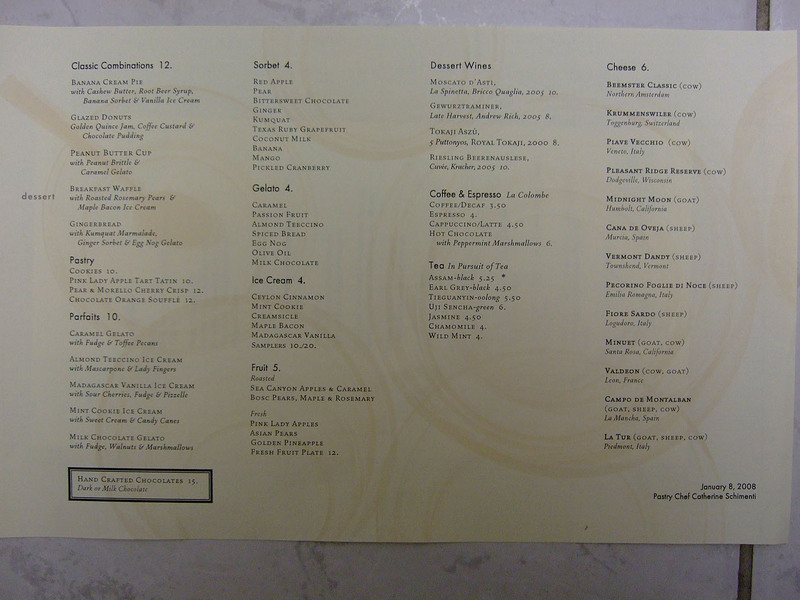 Note that courses 2 and 6 were omitted from the custom-printed menu above. Click for a larger version. Craft presents a fair selection of wines by the glass, with nearly every conceivable varietal offered in some form or another. Click for larger versions. 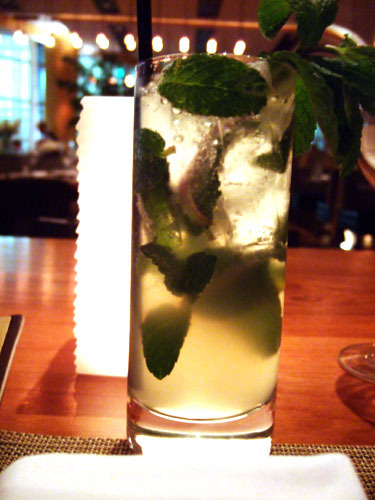 I think it's reached a point where I feel odd if I don't order a mojito to start! In any case, this was a fine example, though with more of an emphasis on the lime than the sugar. They didn't hold back on the rum, that's for sure. 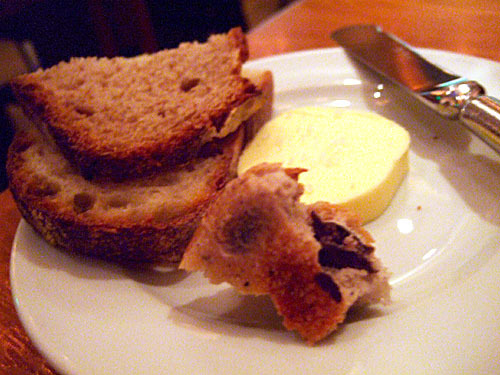 Three types of bread were offered: a standard wheat, olive (my favorite), and walnut-raisin. The butter was of soft texture and nicely salted. Serrano Ham, Black Truffle. This actually reminded me a lot of the butternut squash soup I had at Veritas. 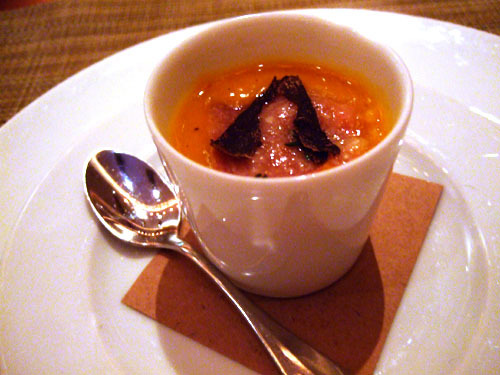 As with Veritas, the squash proved subtle and silky, while the truffle and ham added some stronger complementing notes. 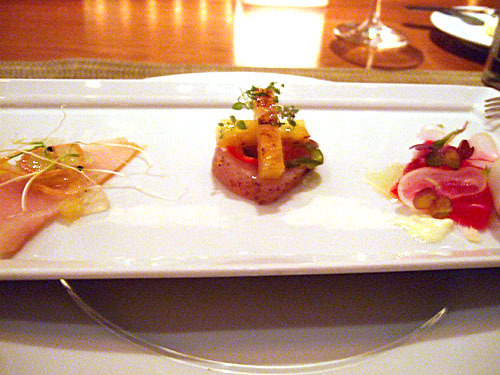 From left to right, we have: Japanese Hamachi & Apple Cider (the pairing of apple cider fell flat for me, while the hamachi itself was a bit dull), Albacore Tuna & Pineapple (I was a bit skeptical of the pineapple, but it worked; great texture on the albacore; my clear favorite), and Bigeye Tuna & Horseradish (perhaps I've just been spoiled with toro, but I thought the tuna lacked sufficient fattiness and flavor; this was helped by the horseradish however). I'm a big fan of having a sparkler with sushi/sashimi, and the Prosecco worked brilliantly here. It's light citrus fruit notes paired beautifully with the various fishes and their accoutrements. White Truffle, Toasted Brioche. 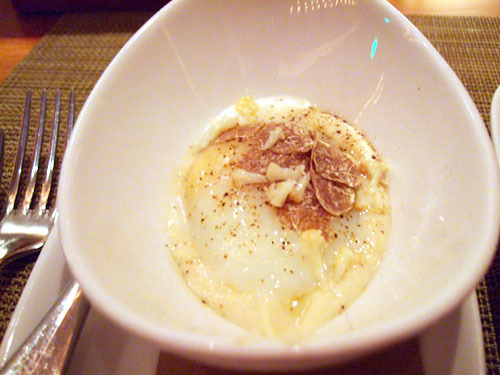 The egg, by itself, was rather nondescript and pretty much indistinguishable from a chicken egg to me, though the truffle did add a nice pungency to the dish. The brioche, on the other hand, was superb. I don't think I've ever had a preparation so rich and flavorful; it was a pleasure using it to mop up the runny bits of egg. 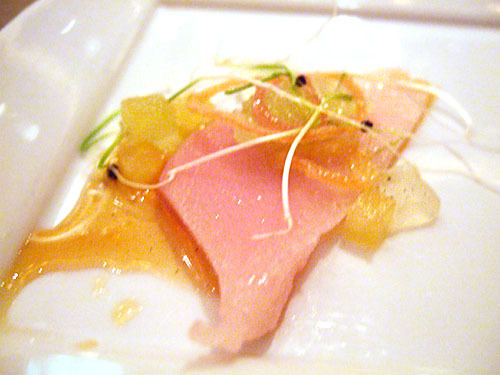 Asian Pear, Calamondin Orange, Cipollini Onion. At first, I actually had some difficulty visually discerning the frog from the sweetbreads (the frog's legs are the larger pieces). Taste-wise however, the difference was clear. The frog's legs were light, tender, and although I hate to be clichéd, they did taste a bit like chicken. 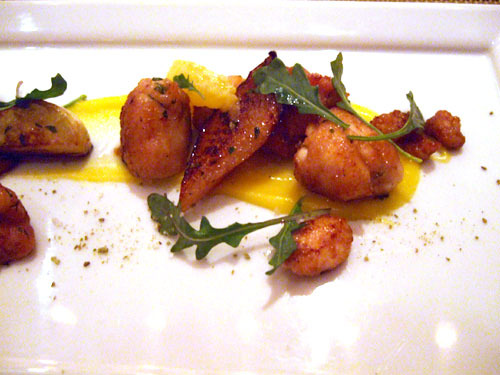 Meanwhile, the sweetbreads had the mildly salty flavor and slightly crispy texture that I've come to know and love. 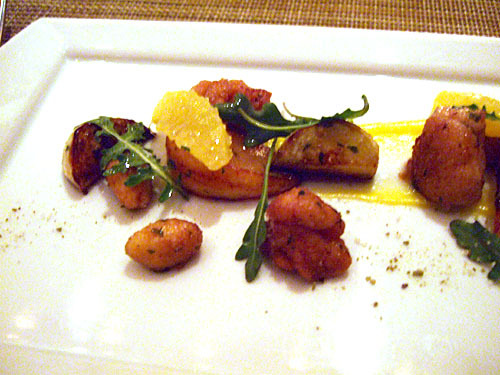 This was one of the best dishes of the night for me. I did enjoy the paired Riesling, which had classic aromas and flavors of stone fruit and apple, while also projecting subtle mineral notes. The wine was light and refreshing, with a medium-length, balanced finish. 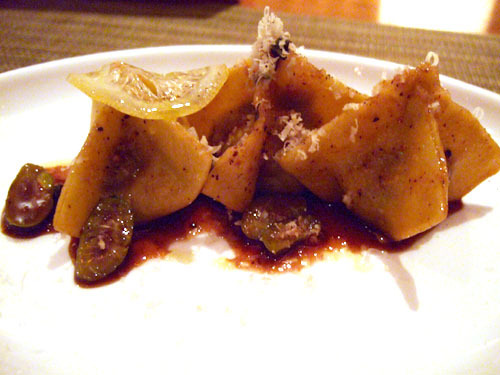 Thick pasta shells concealed superbly flavored, super-tender morsels of oxtail, while the olive added a stark contrast. I imagine that the meat was probably braised or otherwise slow-cooked, to attain this kind of taste and texture. This was one of my favorites of the night. As for the Syrah, it was typical for the varietal, with an earthy, strong nose of meat and berry, wrapped around a core of black fruit and a bit of leather. It was a bit tannic but played well with the oxtail. As a side note, Qupé also seems to be popular at Michael Mina restaurants, such as the original in San Francisco, as well as Stonehill Tavern in Dana Point. Classic sole taste and texture here, which meant the dish could've gone with fewer trappings, though the pomegranate did add a tangy twist to the fish. I'm not a huge fan of Chardonnay, especially when done in the Burgundian style, but I found the Henri Perrusset quite drinkable, with appealing honey and floral aromas, leading to similar notes on the palate. 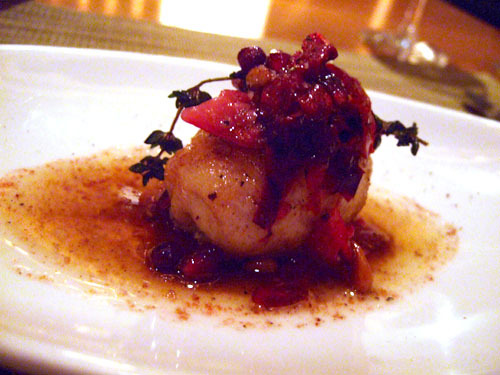 It worked with the sole and especially the pomegranate accompaniment. Unfortunately, the menu I received at the end of the meal was missing two items, and this was one of them (I was able to figure out the duck egg above). Perhaps it was the alcohol, but I cannot for the life of me remember what this dish was. I suspect this might have been the Scottish Salmon & Cucumber from the menu, but I can't be certain. The fish's texture was firm, not flaky, and not oily, while the sauce it was covered in had an almost minty, yet salty flavor to it. Overall quite tasty. This shall forever remain a mystery. Piquillo Pepper, Potato Cake. This was one of the best courses of the night for me. 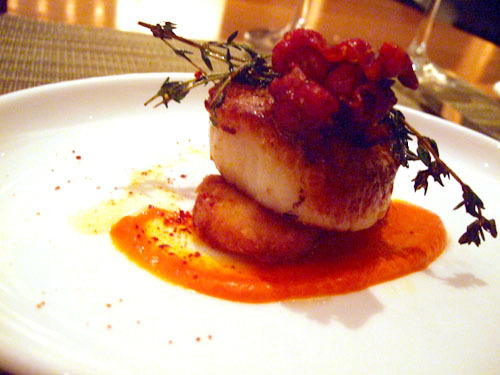 The scallop was perfectly cooked, with a fresh, briny flavor that stood by itself, while also working with the other elements of the dish. I loved the potato as well. The Albariño was light in weight, with slightly spicy and herbaceous notes, leading to a clean finish. I almost never order pork at a restaurant (along with chicken), perhaps because the pork I usually have is generally tough and lacking in flavor. I'm glad to report that was not the case here. The meat itself was indeed very savory, while texture-wise, I was able to cut it using only my fork. 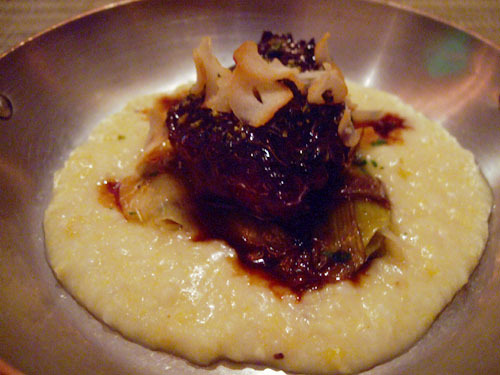 The key was that pork cheek is a rich, fatty, succulent cut that originates, not surprisingly, from the pig's cheek; it's also typically braised, which definitely helps with tenderness. The saddle of lamb is another name for the lamb loin, which is where the most tender and expensive cuts of lamb come from, such as loin chops and loin roasts. With that said, this was quite unlike any lamb chop I've had before, but unfortunately not in a positive way, as I thought the meat wasn't as tender or as succulent as I'm used to. The Kunin was soft and silky, with pronounced berry, meaty, and spicebox notes, leading to a lingering finish; it proved a capable complement to the lamb. Cow, Goat, Sheep's Milk, with appropriate accompaninents. A nice presentation of fromage to transition into dessert; my favorite was the cheese in the foreground (unfortunately I don't recall the name). 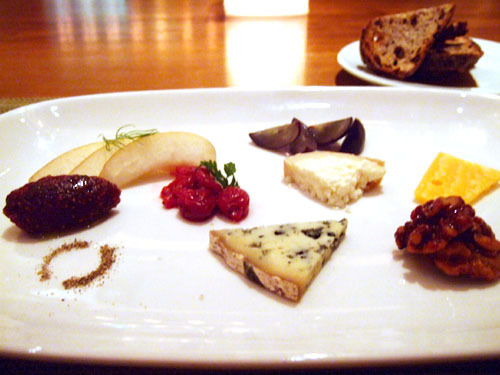 I used to be quite wary of cheese courses, but now they've become something expected, or desired actually. There is truly a lot you can do with cheese. 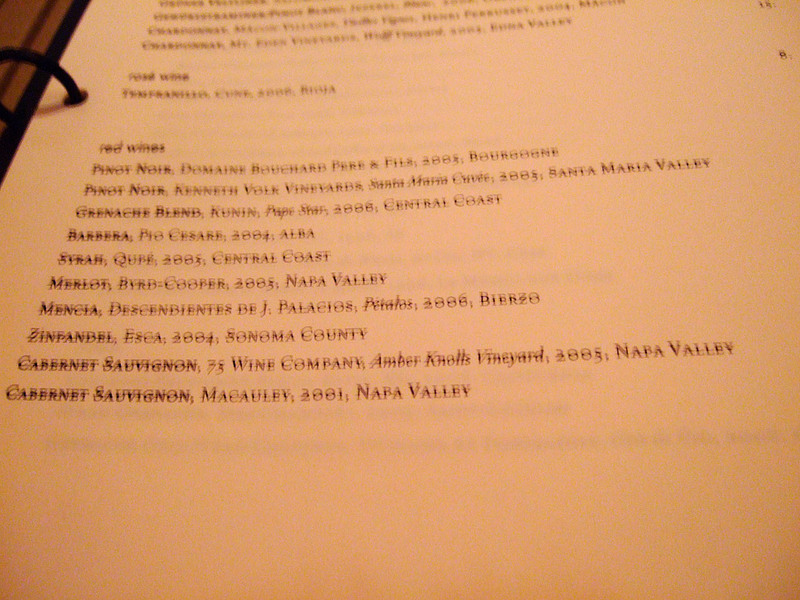 Paired here was the omnipresent Tokaji Aszú. Rich and viscous, the Tokaji presents hints of stone fruit, citrus, and honey on the nose, while becoming heavier and more complex on the midpalate and finish. 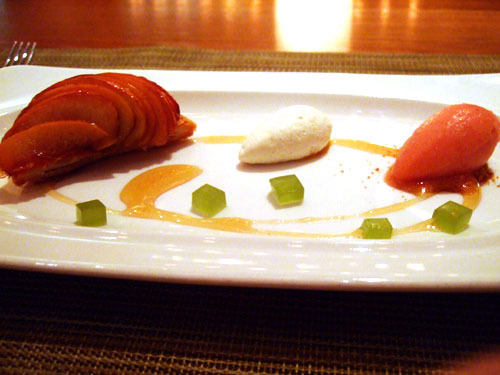 Sour Apple Gelee, Red Apple Sorbet. The warm apple tart itself was good but a bit pedestrian, while I did quite enjoy the sour and refreshing nature of the apple sorbet. Unfortunately, I forget what exactly the item in the middle of the dish is. Persimmon Marmalade, Orange Nuage. 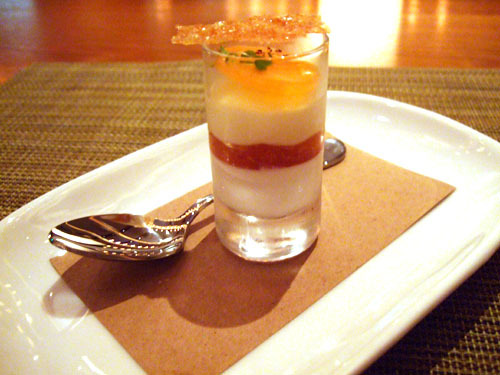 This was sort of a mini-dessert, with the tart marmalade providing a nice contrast layer between the panna cotta. A tasty bite or two. Golden Quince Jam, Coffee Custard, Chocolate Pudding. This glazed dougnut was a step above what you'd get at your local Winchell's and was a nice way to end the meal. 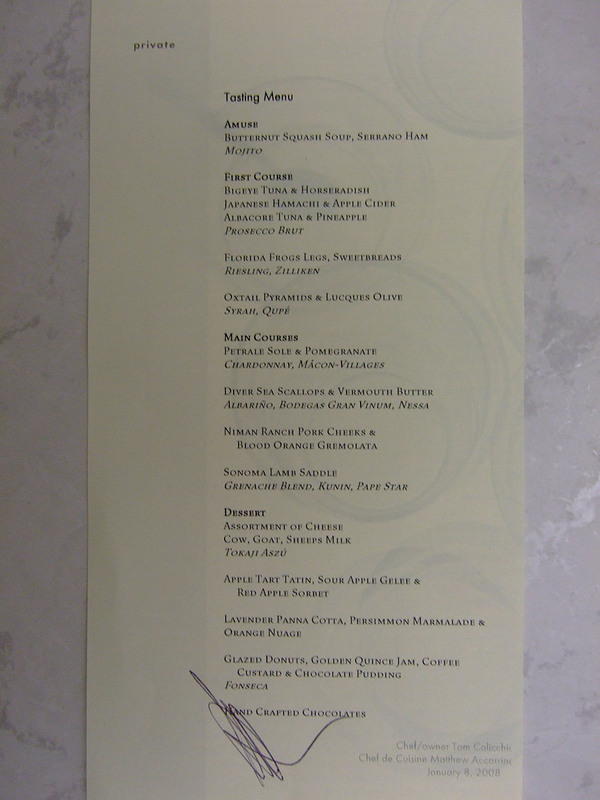 It was further enhanced by the included complements; I especially appreciated the quince jam. 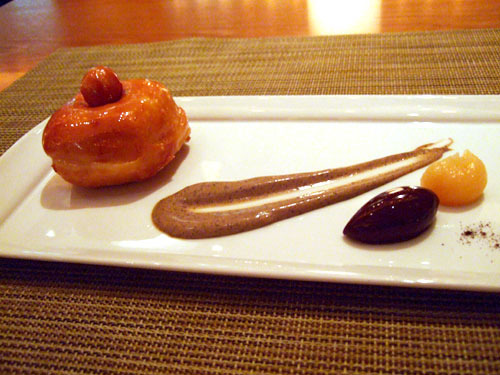 It seems that one of the current trends in fine dining is a reversion to "simpler" dessert items such as doughnuts, churros, or cookies. 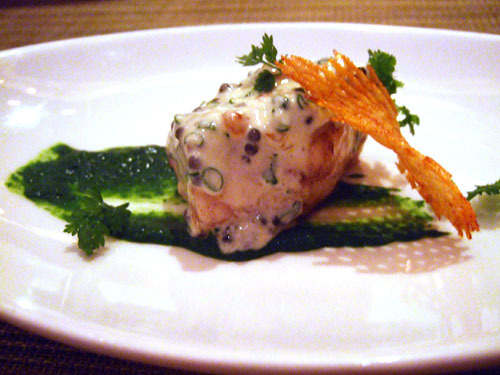 Are we diners are just tired of contrived, overly complex dishes? Time will tell how long this trend lasts. The Port was nice enough, perhaps lacking the weight of a good vintage port, but still presenting rich, ripe notes of berry and spices. The dessert itself was fairly light, so the port worked. 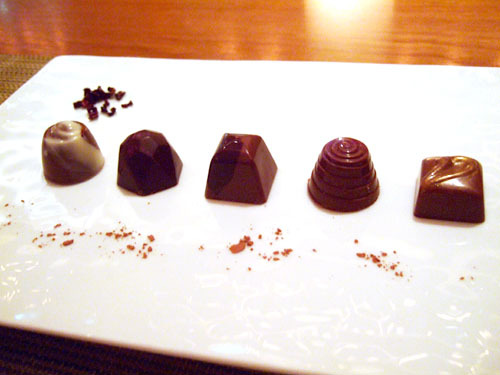 I was presented with a selection of five hand-crafted chocolates at the conclusion of the meal. My server described each one, but unfortunately all I remember is that one contained passion fruit. Nevertheless, all were quite good. 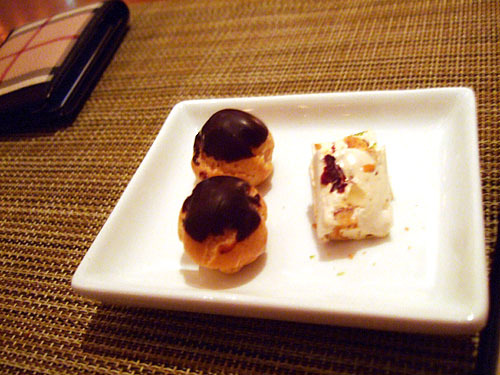 Also, along with the check came another plate, this time with cream puffs and another item I can't recall. This was a delicious chocolate muffin, which I had for breakfast a few days later. Chef Accarrino came out at the end of the night to personally thank me. The tasting was a rather large amount of food, and by the end of the meal, I was struggling to get each bite down. This was quite literally the fullest I'd been since French Laundry. Coming in after eating a large lunch certainly didn't help things either. As a result, I think that although I did enjoy the meal, I didn't enjoy it as much as I could have had I come in with a decent appetite. 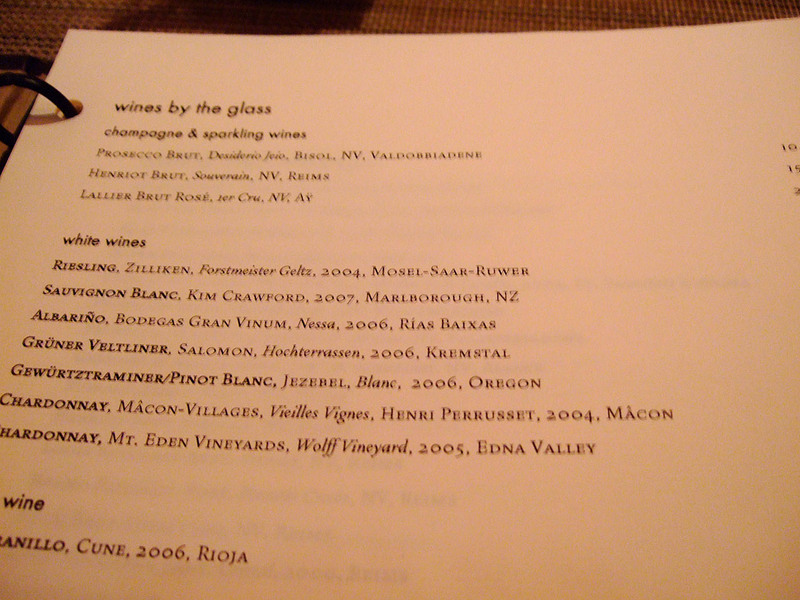 The tasting menu did what was intended; it gave me a taste of the menu. But next time I'm back, I may just order à la carte! 2 years ago i brought a date to craft steak in manhattan and he made the most amazing meal ever for us. i got lucky that night!!!! Ah thanks for the tip. I could see it being monkfish. 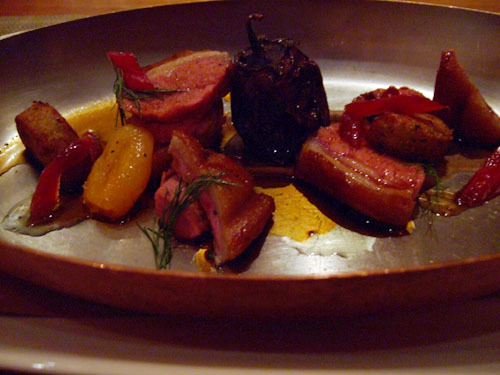 nice post, I found craft to be a superb restaurant. Thanks mattatouille. 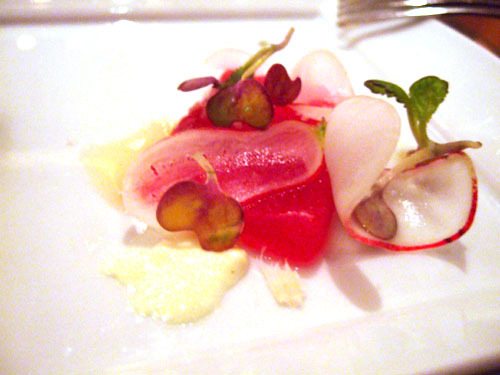 Now that Craft formally offers a tasting menu, I do need to go back some time! On my earlier posts, I didn't include prices, but I definitely do for the current ones. I think this meal was around $140. Hi, Im new to your Blog. Beautiful posts BTW. . . 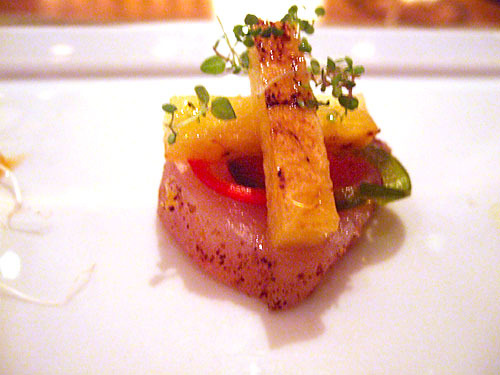 I notice that you order from tasting menus most often. Can anybody do this. How is it billed? Are the portions pictured sample size or would it appear the same if ordered by anyone? Thanks Jim. 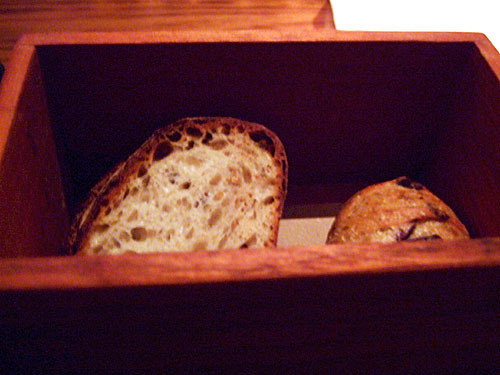 The tasting menu described here was an off-the-menu special, but currently Craft does offer a tasting menu as part of the menu proper. 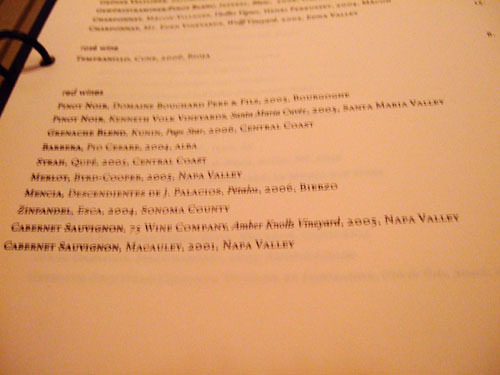 But in general, yes, anyone can do a tasting, and the price should be fixed and listed on the menu. 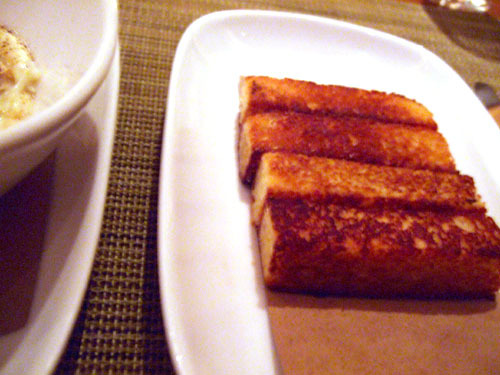 The portions are smaller than usual, to account for the larger number of courses.